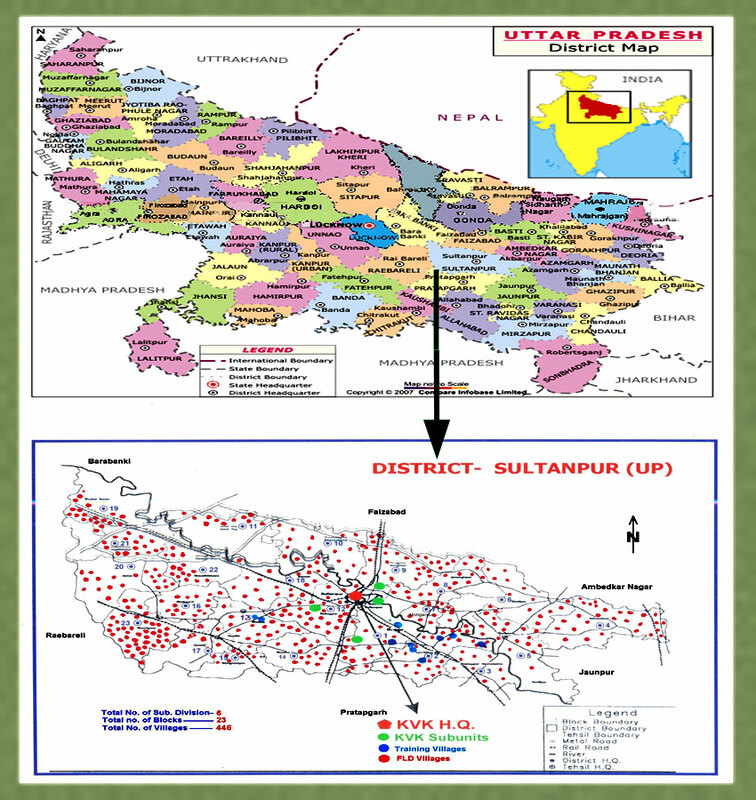 THE DISTRICT - SULTANPUR U.P. Sultanpur is an agrarian district of the eastern-plain zone of U.P. It lies between 81032! and 82041! East longitude and 25059! And 25040! North latitude with geographical areas of 4436 km2.Initially district was divided into three sub-divisions and 19 blocks for administrative and development purposes . Later on it was again reorganize and finally divided into 187 Nyaya Panchayats comprising of 2,529 villages “(1991). Gomti is the only important river of the district . It enters in the district from North-West corner and runs in a well defined courses towards South-East and finally flows into Jaunpur district. The major portion of the district (49.33%) lies in the main basin of Gomti which drains about 17.67% of the total area. Apart from these , there are a number of water bodies locally known as ‘tals’ which also forms an important role. As a whole ,the district is characterized by typical socio-economic and agro ecological situation. The majority of the farming community falls under marginal and small categories with fragmented holding scattered at different locations and poor resources. The soil condition of the district is inherently productive but a good proportion of land is best with productive as stated earlier. Need for improvement of farm productivity of cultivable land by providing information about improved scientific technology, use off improved implements, seed of HYV, introduction of new crops suited to their farming system, pest and nutrient management etc. Need for improvement of soil condition specially, sodic, waterlogged and eroded land by employing low cost techniques for land crop management, as well as management of fruit and forest trees according to land capability and needs of the farmers. Need for diversification in allied activities like, dairy, goat keeping, nursery raising, farm/ agro –forestry, fish culture, fruit and vegetable cultivation. there was also a need to promote agro-based activities like rope-making, basket making, repairing of diesel engine and pump set, welding, fabrication and value addition of farm products for generating self-employment and additional income to the family. The above stated fact indicate that a multi-disciplinary approach is required for formulation of action plan in the district for agro-ecological situation. before developing an action plan and its implementation, future perspective in relation to demographic, ecological and socio-economic compulsions have been also considered to produce more food from lees and less land water using sustainable technologies to provide more income an livelihood opportunities.